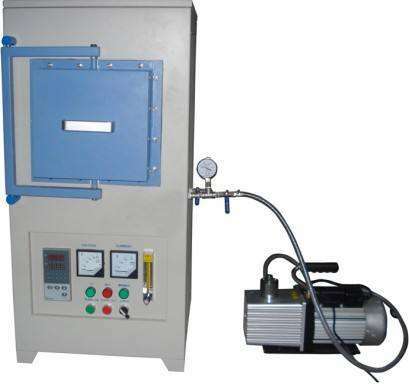 Box-type atmosphere furnace is suitable for the sintering of electronic ceramics and high-temperature structural ceramics, precision annealing and micro-crystallization of glass, crystal annealing, ceramic glaze preparation, powder metallurgy, sintering of nanomaterials, quenching of metal parts and rapid heating Process requirements of the heat treatment, scientific research institutes, universities, industrial and mining enterprises ideal experiment and production equipment. Box atmosphere furnace door can be inverted box atmosphere furnace imported insulation materials – high purity alumina polycrystalline fiber, the use of dual platinum and rhodium thermocouple thermostat AL artificial intelligence regulator 708P temperature controller automatic temperature control, this furnace can be In nitrogen, helium and other inert atmosphere to work so that the workpiece will not produce oxide decarbonization, with temperature field balance, heating and cooling speed, the use of energy-saving features, the appearance of fine, practical. Widely used in ceramics, metallurgy, electronics, glass, chemicals, machinery, refractories, new materials development, special materials, building materials and other fields of production and experiment. 1. To achieve oven / electric furnace heating, insulation, cooling process automatic. 2. Technicians can compile several programs into a temperature control curve, save it in the touch screen, with password protection, one-time preparation of multiple curves. 3. With power-off memory function, check the completed process stage. 4. Field operators need to call a temperature control curve, the direct input curve serial number can call the curve, simple and convenient, put an end to errors. 5. With multiple sets of historical data records. 6. With multi-stage temperature and time display function.